Top row: Dedrain Davis; Jeramey Anderson; Kaya Thomas. Bottom row: Allyson N. Carpenter; Joshua Colas; Jasmine Bowers; Chance the Rapper. Top row: Courtesy of those pictured. Bottom row: Courtesy of those pictured; ANGELA WEISS/AFP/Getty Images (Chance the Rapper). If you know some young black superstars in your community, help us by nominating them for our annual The Root Young Futurists! We want to choose the best of the best for our 2017 list. Our new list will be revealed in February, and we are now accepting nominations. In order to qualify for consideration, the young person needs to be between the ages of 15 and 22 and fully committed to making the world better. We are looking for people who excel in the fields of science and technology, green innovation, community activism, arts and culture, and business. The 2016 list was made up of activists, tech geniuses, writers, young politicians and more. 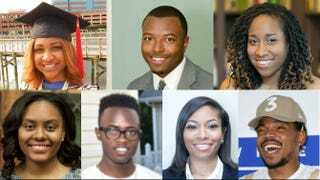 Previous honorees have been selected by the White House to participate in Black History Month events. Twenty-five lucky Young Futurists will be selected, featured and celebrated on The Root in 2017. The nomination period will run through January, and the latest Young Futurists group will be announced in February, so keep an eye out for the list.